Di Wei's bringing out the claws this Merdeka Day with the king of shellfish - lobsters taking the lead role. 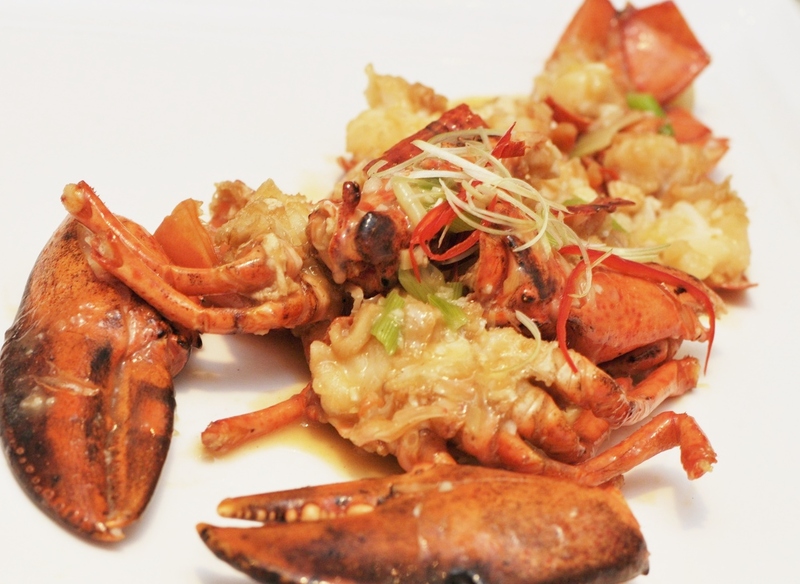 Chef Thian Taik Yong shows you five delicious ways to your heart through his tummy-pleasing lobster dishes: deep-fried with salted egg yolk, baked with cheese, sauteed with garlic, braised with ee-fu noodles or cooked in superior stock. Suffice to say, whichever cooking style you choose, the sweet and succulent luxurious Boston lobsters (RM128++ per portion) are guaranteed to ensure utmost satisfaction. 'Less is more' is the ruling maxim for our first serving that had a whole lobster sauteed with garlic. Speckled with minced garlic, the lobster's inherent sweetness was clearly discernible, amplified by the chef's choice of aromatic accent. Most importantly, the shellfish wasn't overcooked; it was pleasantly firm but not hard to the bite. The second offering that had the lobster braised with ee-fu noodles was equally top notch. If you prefer landing dishes with greater substance, this option will float your boat. 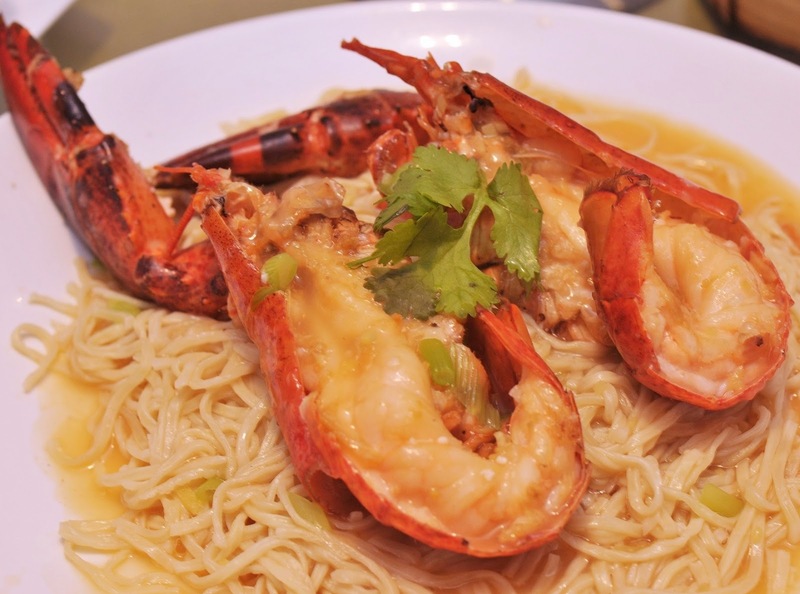 The silky noodle threads taste irresistibly rich; suffused with salubrious lobster jus and complemented by chunks of springy lobster meat to boot. Although the Boston Lobster promotion runs until today (August 31), chances are the lobsters will still be available while stocks last. Experience more heart-touching moments with your loved ones over sumptuous servings of Di Wei's latest Dim Sum selection (RM9++ per basket). 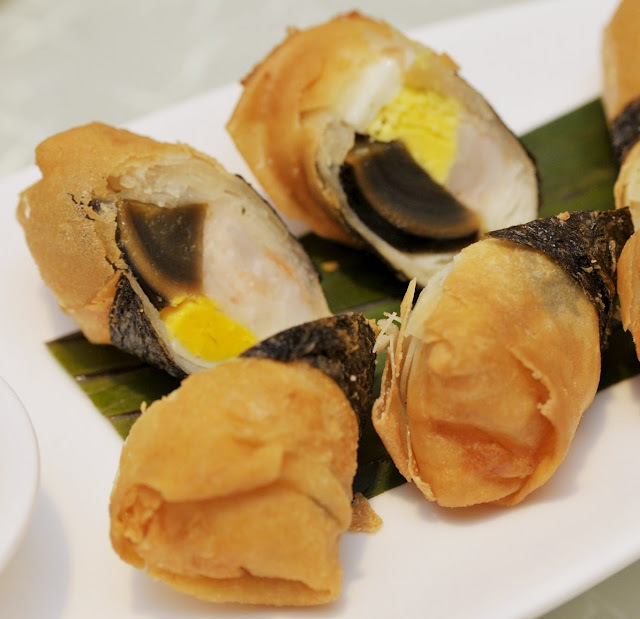 We recommend the newest Steamed Three Treasures Prawn Dumplings and Deep-fried Twin Egg Rolls. Har gaw or prawn dumpling - a timeless classic - is updated with tiny dollops of crunchy ebikko (prawn roe), chopped spinach and mushroom. A smart move on the chef's part as these add colours and textures to the otherwise plain, pale dumpling. Crunchier and contrasting textures emerge from the latter. 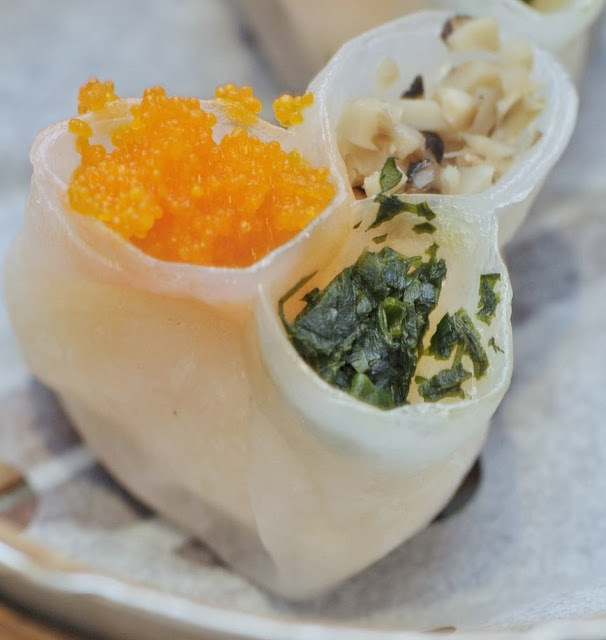 We also love how the century and quail eggs' presence brought a different dimension to the usual spring roll. Best of all, I welcome the new dessert creations (RM8++ per portion) that lend a sweet finish to the meal. 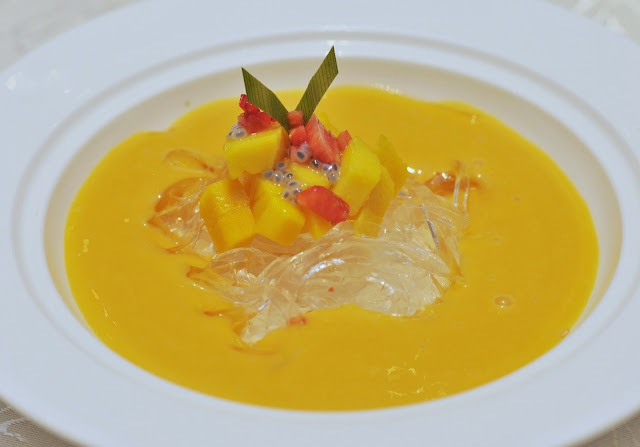 The Mango Puree Crystal Noodles will give your jaw a good workout thanks to the chewy, gelatinous strips immersed in the dulcet smooth, fresh mango puree with diced strawberries and basil seeds. 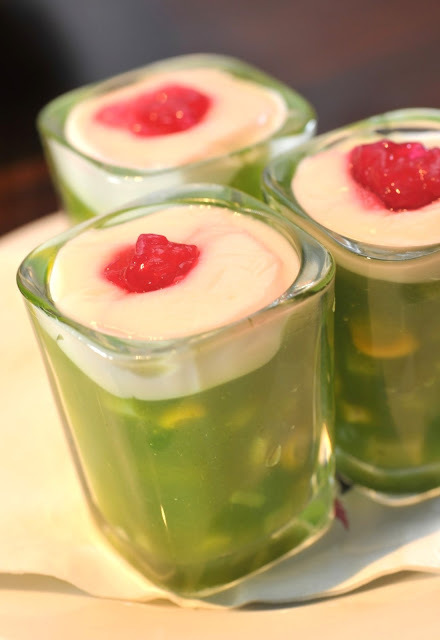 Love agar-agar? 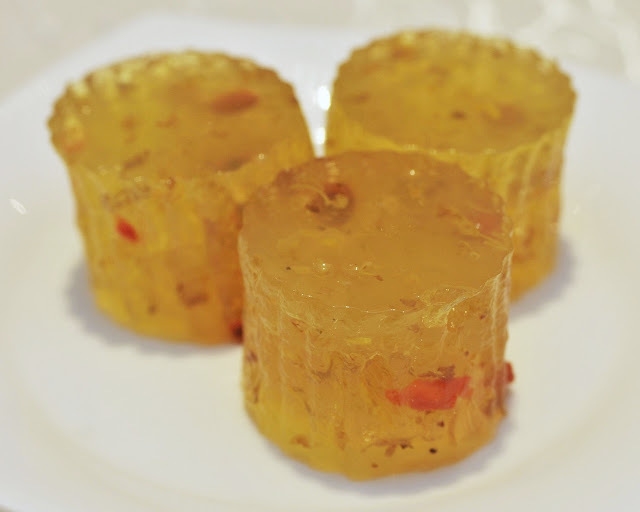 Then you'd go weak in the knees over the subtly sweet, beautifully cut Osmanthus and Wolfberries Jelly that look like oversized amber gemstones with wolfberries embedded in them. 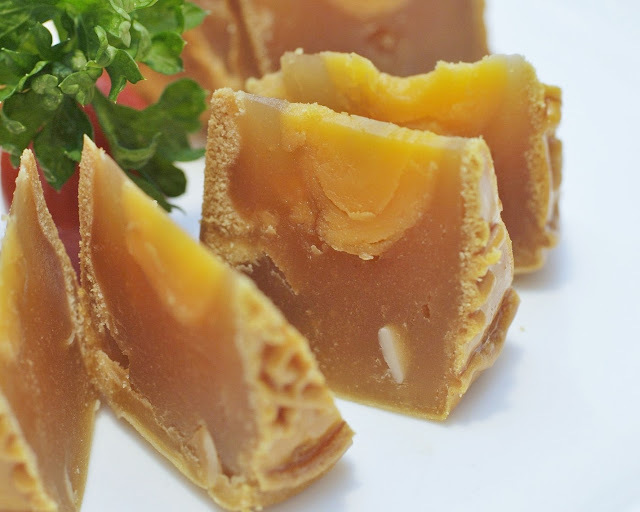 For the Mid Autumn Festival on September 19, the restaurant has eight varieties of mooncakes for sale. While the fail-safe Pure White Lotus Paste with Single Yolk is notable, our preferred variants are the Baked Pandan Lotus Single Yolk and Snowskin Black Sesame Single Yolk mooncakes. Prices range between RM16.50 and RM20 each. Dim sum is served at Di Wei daily from 11 am to 3 pm. On Sundays and public holidays, the hours are extended from 3 to 6 pm. The restaurant is open on Saturday, Sunday and public holidays from 10.30 am to 3 pm. Dinner hours are from 6 pm to 10 pm. For reservations, call Di Wei at 03-5565 1388 or visit www.empirehotel.com.my for further info. Stepping into the monochromatic, elegant confines of Maison Francaise is like entering a space continuum where time stands still. Despite its central location right smack in the city, the secluded restaurant sited along a road less travelled is an oasis of comforting tranquility and a refined haven of French cuisine. Besotted love birds, discerning wheelers and dealers and the upper-crust will feel at home within its spacious yet intimate surroundings. Glass-panelled folding doors and lace curtained windows allow plenty of natural light in by day whilst multi-pronged chandeliers and wall-mounted lights transformed the interior into a warm, welcoming cocoon at dusk. Contemporary artworks adorned the whitewashed walls, juxtaposed against clusters of pristine white-clothed tables and sleek dining chairs. Atop the main dining area of the stately bungalow is a private room that doubles up as a modern cigar and whiskey lounge. Tucked away in the lower ground level is another roomy lounge that comes with a full bar and leads out to a shaded poolside patio, an ideal venue for special events and parties. 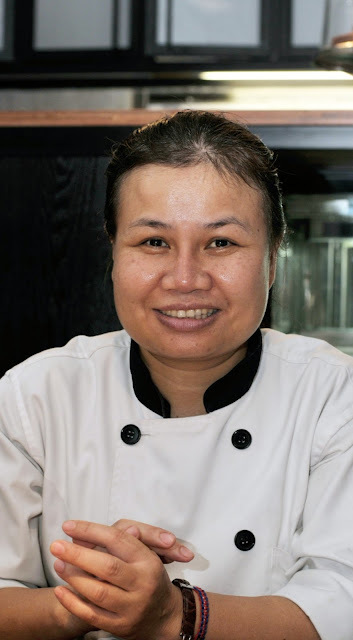 Sainy Chun, the genteel, sophisticated proprietress is no newbie to the restaurant scene. Having lived for years in Italy, France and the United Kingdom, she has even pursued a sommelier course and possesses an avid interest in all things culinary. 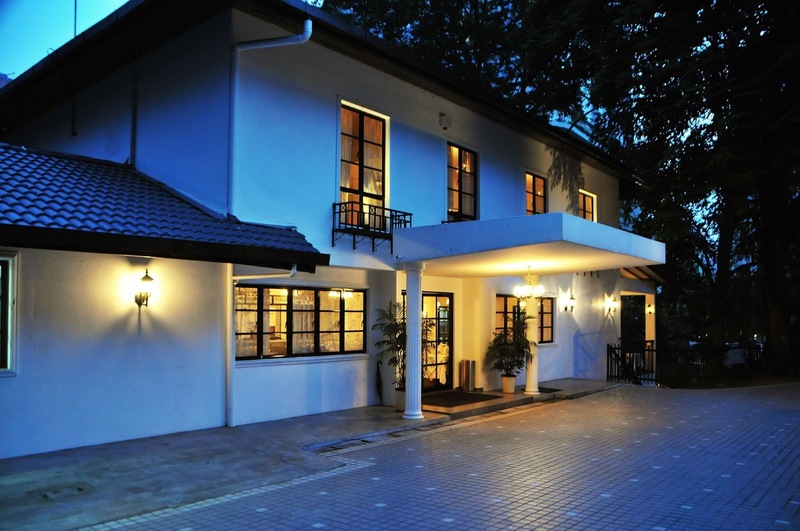 Previously a boutique hotel owner and restaurateur whose business interests traversed Europe, Korea, Japan and China, her demure looks belie her steely determination in carving a niche for Maison Francaisein the KL dining scene. Joining forces with executive chef Franck Lamache whose impeccable credentials include past stints at several 3-Michelin starred establishments: the Crillion hotel Paris (Les Embassedeurs), Alain Ducasse and Le Taillevent, the duo's debut has made enough waves to make the city's gourmands sit up and take notice. The chef's classic French cuisine rules the roost here; exquisite creations that are light on the palate and uncompromisingly flavourful yet distinctly modern in presentation. 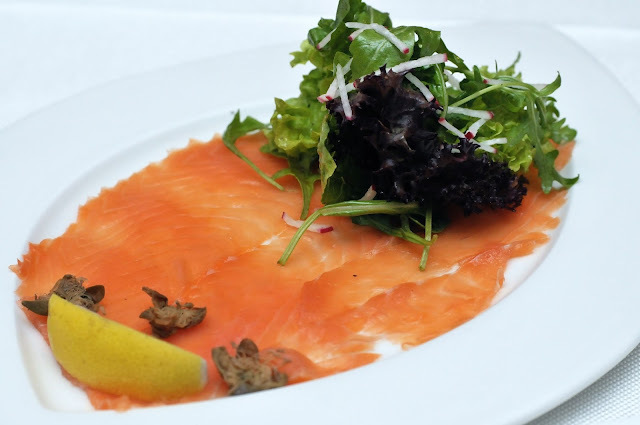 For starters, the house speciality of Homemade Smoked Salmon with Capers and Bouquet of Salad (RM51++) is a timeless delicacy that one never tires of eating. The fish's delicate freshness shines through in every thin sliver; its mellow smokiness amplified by the opened florets of capers. Comparatively, the succulent Marinated Smoked Salmon with Herbs (RM45++ available only in the special dinner menu) boasts a delicate brininess that's accentuated by a sprinkling of fresh dill. 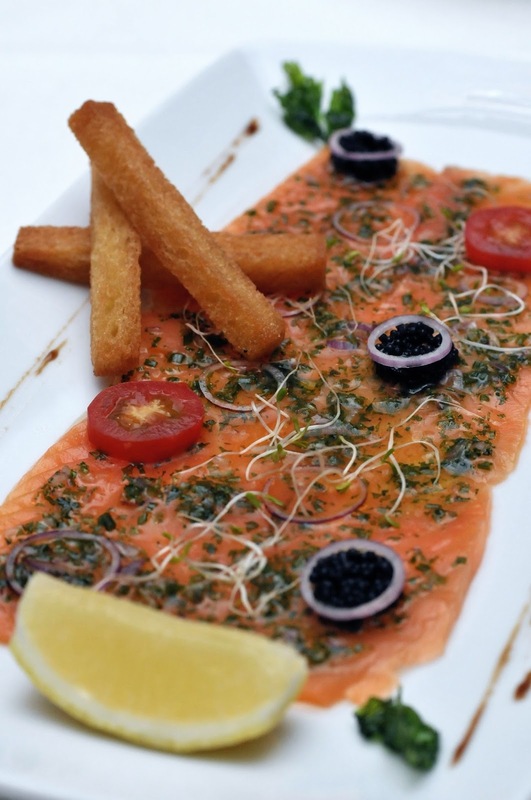 The tissue-thin slices come dotted with caviar in addition to deep-fried bread fingers and micro sprouts. I had my second encounter with sweetbreads that night at Maison Francaise. In spite of my (silent) misgivings, the Chef's Special of Sweet Bread with Red Wine Sauce (RM110++) is so outstanding that it completely restored my less than favourable impression of this unusual offering. For the uninitiated, sweetbreads are calves' thymus glands...not exactly something easy to stomach if you're not big on offal or innards. 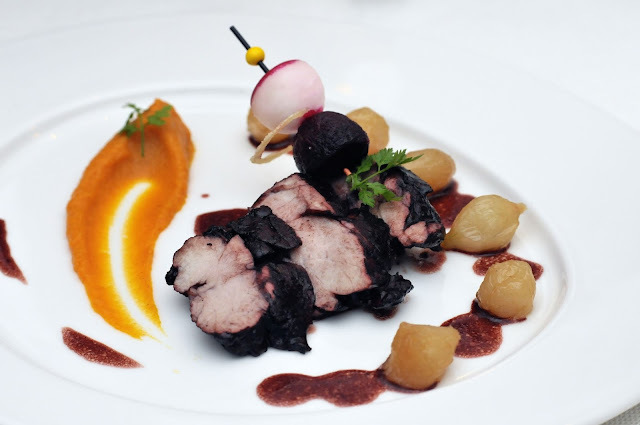 Chef Lamache should be lauded for rendering the sweetbreads into tender, almost spongy pieces with fleeting hints of the wine's slight tanginess punctuated by sourish bursts from the tiny pickled pearl onions and the sweetness of pumpkin puree. Brimming with deep-seated rusticity is the delectable Duck Pate (RM44++). 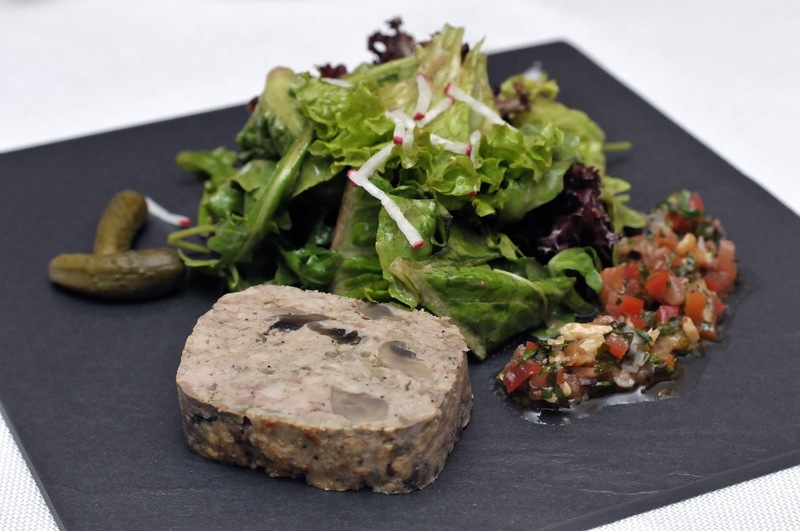 Lightly spiked with French country spices and herbs, the delebtable terrine accompanied by fresh salad leaves, pickled baby gherkins and finely diced tomatoes tastes even more enjoyable with warm, oven-fresh breads. 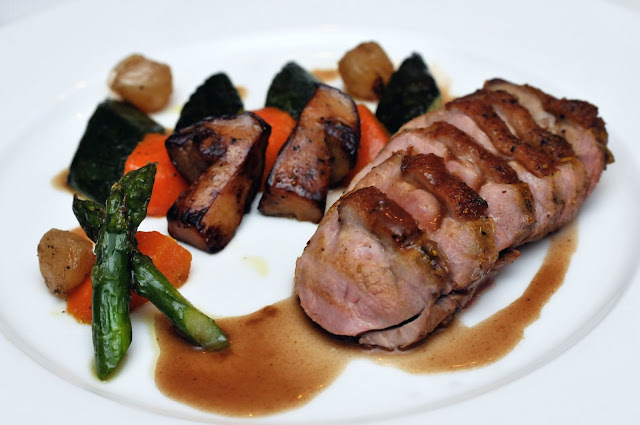 Another signature dish that causes quite a flap is the Duck Breast with Grilled Mushroom, Asparagus and Zucchini. Memorable for its crispy skin which lends additional dimension to the tender, juicy meat. The slightly charred vegetables and fungi bring textural depth to the overall dish. 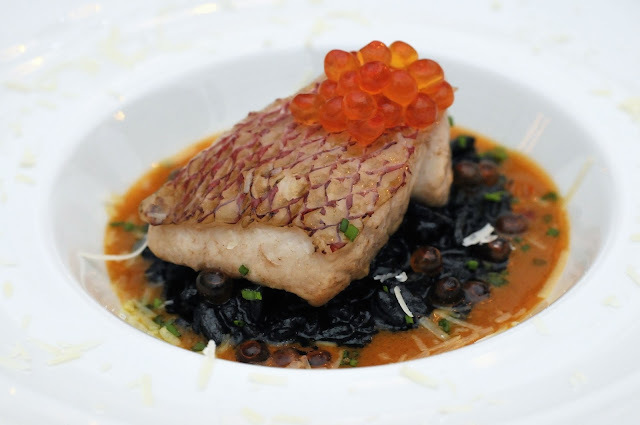 Sample the Red Snapper with Squid Ink Risotto and Salmon Roe (RM77++) when it's piping hot; the fish's inherent sweetness is at its peak then. Dusted with fine cheese shavings around the plate edge, the slightly nutty short grain rice is richly ambrosial and toothsome on the palate with intermittent bursts of brininess coming from the brilliant orange globules. 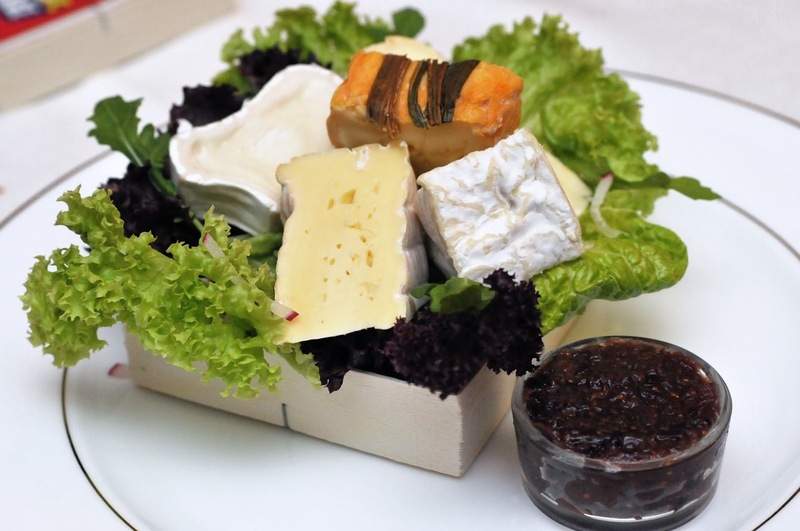 No French meal is ever complete without a Cheese Selection (RM31++) to round off proceedings. Nestled in a bed of greens, the assortment consists of soft, semi-hard and firm wedges in varying degrees of sharpness and pungency that can be appreciated on its own or with the restaurant's fine breads. Remember to leave ample tummy space for dessert. 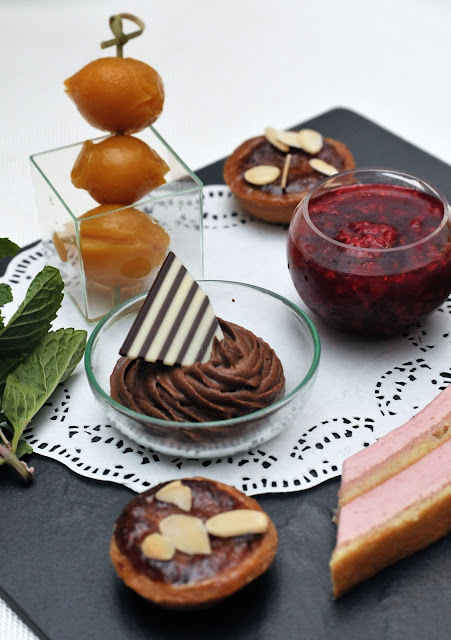 Presented on a square slate, the Cafe Gourmand (RM55++) will satisfy the sweet-toothed with dainty, decadent treats that range from dulcet smooth chocolate mousse to marinated mirabelle plums. Our evening was further enlivened by the resident award-winning mixologist who plied us with two captivating drinks: French Planter and Martini Espresso. 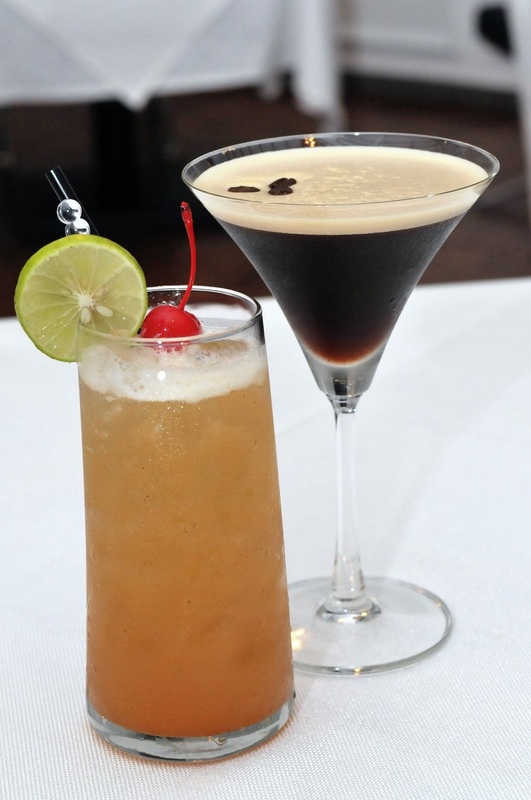 It's hard to say which appealed to us more as both cocktails are simply unforgettable. The first has rum, lime and orange juice mixed with pink guava, cinnamon and vanilla extract while the second is concocted from ultra-smooth 100% single blend Arabica espresso spiked with vodka, illy coffee liqueur and syrup. 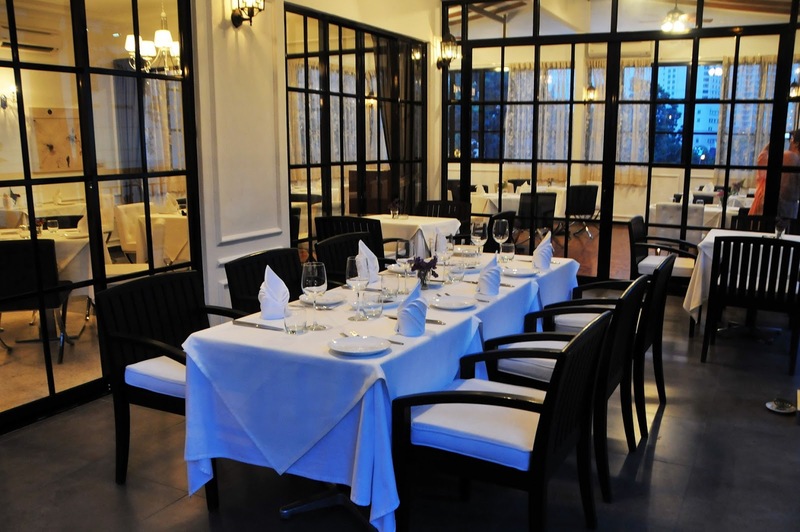 Maison Francaise definitely rules the roost when it comes to refined French cuisine. There's always a good story behind good food...that's Chef Justin Hor's core philosophy and he's spot on. 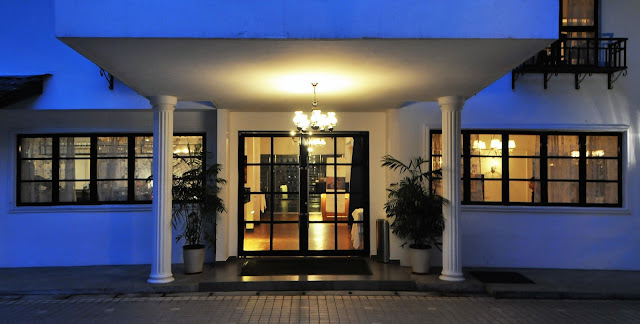 The savvy director and group executive chef of The Oriental Group is a great story teller with the ability to weave interesting anecdotes and insights into a plethora of signature specialities at the group's latest chapter - Noble Mansion. Designed to showcase refined Chinese creations for special banquets and private dinners, the posh and artfully furnished interior befittingly mirrors that of an opulent mansion. Several themed private dining rooms, some complete with karaoke facilities are included but it was the central dining enclave that took our breath away with its stunning centrepiece - a bespoke, complex light installation. "We have many set menus that give first-time diners an overview of what we offer," said Justin Hor who joined us for dinner that evening. "The set menus serve as a sampling of sorts, an introduction of what's good. By their second and subsequent visits, diners will know what to order. 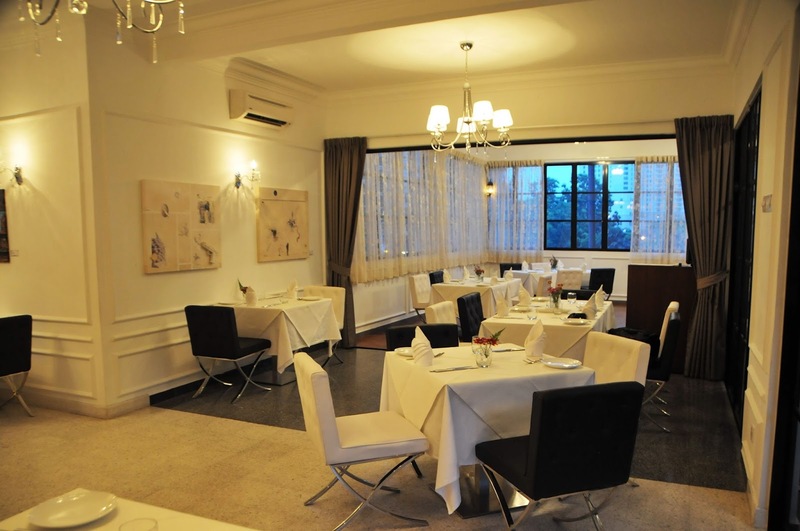 Another selling point here is most of Noble Mansion's specialities are drawn from Shunde, Guangzhou - a place famous for its Cantonese dishes and wing chun martial arts that's popularised by exponents like Ip Man." At the lavish preview, we feasted like nobility; each dish competed for our attention with such imaginative pairing of ingredients and inventive approach that our heads were left spinning from all that creative sparks. Dainty servings of Liver Sausage Char Siew Rolls (RM16 per person), Smoked Vegetarian Spring Roll (RM8 per portion) and Japanese Cucumber with Minced Ginger (RM8 per portion) started the ball rolling. As expected, the scrumptious porky rolls left us in rapture over their delicious richness. We even polished off the crunchy cos lettuce tossed in a creamy, peppery dressing and skinned cherry tomatoes that had been marinated a day in preserved asam boi (preserved salted plums) sauce. Yes, they were that good! I like the hotness of the chopped young ginger heaped onto the chilled, matchstick-thick Japanese cucumber batonettes. The dish's pared down simplicity was an amalgamation of stimulating hot and cold contrasts on the tongue. Another delicacy to get wrapped up in is the smoked vegetarian spring roll - an epitome of delicate flavours and subtle crunchy textures that served as a light precusor to pique interest and leave one wishing for more. Whetting our appetite further is the incredibly addictive Premium Anchovies & Starfruit in The Oriental's Cincalok Sauce (RM14 per portion) - it's hard to stop nibbling on the juicy chunks of starfruit with crispy, caramelised premium anchovies in a zesty XO-type sauce. Trust the Chinese to draw out the best in seafood and the Steamed Fresh Water Prawns (RM28 per person) with 8-year old Xiao Shing wine was a perfect example of such ingenuity. Everyone got half a prawn each, the doneness superbly succulent; its inherent sweetness enlivened by some creamy organic egg yolk sauce. Reeling fish lovers in is Shunde Style Steamed Ocean Garoupa (RM330) perked up with superior soya sauce, black beans, sliced garlic and some sliced pickled red and green chillies. I particularly enjoyed the ribbons of translucent flat noodles that soaked up all the flavourful juices exuded from the firm fleshed fish. Understandably, in Shunde, the original version is much simpler so Chef Hor has jazzed it up by giving the dish extra colours and greater depth using local accents. He also told us that the chewy noodles weren't identical to the ones in Shunde but the closest alternative he deemed acceptable. C'mon, let's go the whole hog eh? A whole roasted suckling pig (RM330) prepared Macau-style was brought to the table which we fell on after the photo session like hungry wolves. The crisp, crackling skin shone that like lacquer and the layer of well-seasoned, slightly briny meat left us almost gasping in orgasmic ecstasy at every bite. We learned that the chef's secret marinade is so closely guarded that Hor himself personally doles it out each day. More robust nuances assailed our palates with the appearance of the majestic treat of Lobster with Chicken and Pig's Stomach in Spicy Sauce (RM80 per portion for 4-6 persons). It was akin to eating the perennial steamed village-bred chicken ramped up with the luxurious addition of lobster meat and toothsome slices of pig's stomach. My only complaint was there was too little of this to go around especially the piggy part! We had a double dose of suckling pig - this time with stuffed with some steamed Glutinuous Rice (RM330), turning it into a substantial dish that left us replete. I was especially happy to be given extra spring onion florets as their bracing sharp nuance helped to counter and balance out the indulgent meaty richness. Some Braised Wolfberry Shoot (Gaugei) with Eggs (RM28 per portion) then brought a hint of green to our dinner. The leaves' mildly bitter after taste was tempered by the smooth egg sauce. Hor opined it is imperative to get the saucy texture right "similar to that of soft boiled egg". To cleanse our palate, glasses of lemon and starfruit juice were proffered. It was a welcome drink that we appreciated for its tart, refreshing tanginess. Chilled Sweetened Fuji Apple with Snow Jelly, Gingko, Fresh Lily Bulb and Red Dates (RM13 per person) and Longevity Piglet Bun (RM28 for a serving of 4 pcs) rounded up our dining affair with sweet flourish. The dessert broth was light and mercifully mildly sweet while the whimsical piggy shaped buns complete with blushing pink cheeks just begged to be eaten. Look ma, it's a piglet invasion! The filling even had an element of surprise in it for instead of just pure lotus seed paste, we discovered salted egg yolk in the centre...it was again a playful dimension of tastes and textures. These whimsical buns can be ordered for birthdays and other family celebrations ahead of time. Thank you PureGlutton for this delicious opportunity to hob nob with the Oriental Group's marketing team whose hospitality is greatly appreciated.